To develop a new strategy for generating an animal model of temporal lobe epilepsy. A total of 160 healthy adult male SD rats were used to generate the models of temporal lobe epilepsy by three kinds of techniques and select an optimal technique to generate a suitable model of temporal lobe epilepsy. The animals were assigned to a amygdale-kindling control group (AKC group), lithium chloride-pilocarpine control group (LPC group), a lithium chloride-pilocarpine followed by amygdale-kindling group (PAK group). Other healthy normal rats were used as normal rat control group (NRC group). The epileptic seizures, the EEG changes, the expression of ZnT3, Glial Fibrillary Acidic Protein (GFAP), and GABAA receptors, the number of hippocampal pyramidal cells detected by Nissl’s staining were compared among groups. The rate of successful model of temporal lobe epilepsy, the spontaneous seizures in the PAK group were significantly greater than those in the AKC group. The mortality in the PAK group was significantly decreased compared to the LPC group. The decreased number of pyramidal cells and GABAA receptors, MFS and astrocyte hyperplasia were found in the hippocampus of the epileptic rats in the PAK, AKC and LPC groups. Compared with the traditional amygdala kindling model, intraperitoneal injection of lithium chloride-pilocarpine combined with amygdala kindling (PAK group) decreased the time of modeling, increased the success rate of temporal lobe epilepsy modeling. Compared with the traditional lithium chloride-pilocarpine model, the mortality decreased significantly in the improved model (PAK group). The pathological features of the reformative model (PAK group) were consistent with the results of the amygdala kindling model (AKC group) and lithium chloride-pilocarpine model(LPC group). It is a viable way to improve the rat model of temporal lobe epilepsy. The strategies for developing an temporal lobe epilepsy model in our study might be a reliable method. Such strategies increased the success rate of preparing the model of temporal lobe epilepsy than single amygadale kindling and decreased the mortality compared with the single lithium chloride-pilocarpine model. Epilepsy is one of the most common neurological disorders. Despite the recent introduction of new AEDs, about one-third of patients with epilepsy have seizures resistant to pharmacotherapy . Temporal lobe epilepsy (TLE) is associated with increased morbidity and mortality, serious psychosocial consequences, cognitive problems, and reduced quality of life . There is a clear need for more effective and better tolerated therapies for the treatment of temporal lobe epilepsy. Adequate experimental models of intractable epilepsy are absolutely necessary for the research of novel anticonvulsant drugs. Such models are not only needed for the search for new drugs but also for the study of mechanisms of drug resistance in epilepsy. In the last few decades, a number of animal models of epilepsy or epileptic seizures have been developed. However, only few chronic models of epilepsy are currently used for pharmaco resistance studies of epilepsy or epileptic seizures . During these models, kindling was the first proposed animal model of drug resistant partial epilepsy which also has been proposed as a model to investigate intractable epilepsy in recent years . Amygdala-kindling was first proposed as a model to investigate intractable epilepsy in 1986. This proposal was based on several lines of evidence. Among the most important factors indicating a poor prognosis of epilepsy is the site of the primary epileptogenic focus and the period of time over which the patient experiences repetitive seizures without treatment. Since kindling involves a progressive potentiation of seizure susceptibility as well as a functional change in secondary brain sites, due to repetition of partial seizures, kindling may provide a powerful model to investigate the question why epilepsy becomes intractable . Wolfgang Lo¨scher found that by directly comparing standard antiepileptic drugs in the amygdala-kindling model and thestandard maximal electroshock seizure (MES) test in agematched female Wistar rats, kindled seizures were less sensitive to anticonvulsant treatment than primarily generalized seizures as produced in the MES test. Many scholars proposed that search for novel compounds with high potency in the kindled amygdaloid seizure model may thus be apromising strategy in the development of new antiepileptic drugs for patients with intractable epilepsy . Another important category of chronic models of epilepsy are models in which spontaneous recurrent seizures develop after chemical or electrical induction of a sustained SE. The most frequently used model of post-SE TLE is the PILO model since anatomical changes resembling those seen in human mesial temporal sclerosis develop after the initially induced SE . Variations of the pilocarpine model have been established by combining this convulsant with other drugs, such as lithium, picrotoxin, cycloheximide, MK-801, and N omega-nitro- L-arginine methyl ester. The lithium-pilocarpine combination has been the most widely used. The sequence of behavioural changes observed in animals undergoing a SE was very similar for lithium-pilocarpine compared to pilocarpine administered alone, and animals treated with lithium-pilocarpine showed a decreased variability in time to SE onset . Although these two models have been widely used in animal models of TLE, it is often argued that these models still have some drawbacks: In amygdala kindling model, most studies on kindlingexamine rats that do not exhibit spontaneous seizures,so that neurobiological alterations in such rats may differfrom those underlying development of spontaneousseizures3. Besides, an important difference between the rat kindling model and human symptomatic temporal lobe epilepsy is that, in kindling, the seizureinducing stimulus is applied to a normal brain. Whereas a fully kindled brain might reveal neuronal loss and axonal sprouting, these structural changes are mild and are a consequence rather than a cause of the evoked seizures . Among the drawbacks of the lithium-pilocarpine model is that pilocarpine at the high doses used does not always induce SE. Furthermore, the use of such high doses is associated with a high mortality rate . Also in the lithiumpilocarpine model the mortality rate remained very high (92%-95%) when pilocarpine was given in a dose of 30 mg/kg [11,12]. Decreasing the dose of pilocarpine in lithium-treated rats resulted in a decrease in mortality rate, but this was concomitant with a fall in the success rate for inducing SE . Neither lithium (3 mg/kg) nor pilocarpine (30 mg/kg) caused abnormal EEG responses when administrated alone [11,13]. Above all, the lithium pilocarpine model is not an accurate model of temporal lobe epilepsy, because the pathology of the lithium pilocarpine model is extensive, not limited to hippocampus. Furthermore, the hippocampal damage is bilateral and seizures are much more frequent than what is generally seen in clinical temporal lobe epilepsy. Based on the shortcomings of the above two models, we aimed to find a more efficient method to generate an animal model of TLE, which can reduce mortality compared with the lithiumpilocarpine model, shorten the kindling time and improve the kindling success rate compared with the single amygdala kindling model, especially develop more frequent spontaneous recurrent seizures (SRSs) than the single amygdala kindling model. In the current work, we firstperitoneal injecting low dose (10mg/kg) of PILO to lithium-treated rats and then carry outamygdala kindling. The main findings of our work were that compared with the lithium-pilocarpine model, the mortality rates showed significant decline. While compared with single amygdala kindling model, our reformative model spent less time in kindling and showed a higher modeling success rate visibly, the epileptic animals in the reformative model displayed more frequent SRSs. We also confirmed that the pathological morphologic alterations of the improved model were as typical as the lithium-pilocarpine model and the single amygdala kindling model. This study was approved by the Animal Care and Use Committee of Guizhou Medical University. A total of 160 healthy adult male SD rats, approximately two months old, were purchased (body weight is 180–220 g). They were individually housed in galvanized wire mesh cages with free access to food and water. The laboratory room temperature ranged from 21 to 25°C and natural lighting characterized the environment. The animals were moved to the laboratory one week before the experiment to allow for adaptation to the environment. The primary reagents utilized in this study consisted of chloral hydrate (Shanghai New Asiatic Pharmaceuticals Co., Ltd, Shanghai, China), penicillin sodium for injection (Shandong Lukang Pharmaceutical Co., Ltd.), self-curing denture acrylic (Shanghai Dental Material Factory), PBS(Solarbio, Beijing, China), SDS (Solarbio, Beijing, China), Tris (Solarbio, Beijing, China), Glycine (Solarbio, Beijing, China), aquae formalinata (Sinopharm Chemical Reagent Co., Ltd., Shanghai, China), dimethylbenzene (Sinopharm Chemical Reagent Co., Ltd., Shanghai, China), absolute ethyl alcohol (Sinopharm Chemical Reagent Co., Ltd., Shanghai, China), 3%H2O2 (Sinopharm Chemical Reagent Co., Ltd., Shanghai, China), fetal bovine serum (Gibco, Aus), Anti-fluorescent decay solution (Bioswamp, UA), RIPI buffer (Beyotime, Shanghai, China), BCA kit (Beyotime, Shanghai, China), rabbit anti-GABAAR (Abcam, UK), rabbit anti-GFAP (Abcam, UK),rabbit anti-zinc transporter 3 (ZnT3) (Abcam, UK), alexa Fluor 594-conjugated Donkey Anti- Mouse (Bioswamp, UA), fluorescein (FITC)– conjugated Affinipure Donkey Anti-Mouse IgG(H+L) (Bioswamp, UA). The following instruments and associated reagents were used in this study: stimulating electrodes (nichrome enameled wire with a diameter of 0.1 mm and Teflon-coated, except for 0.03 mm at the tip, made by the authors), a BL-420 biological functional system (Chengdu Thai League Science and Technology Co., Ltd, China), a DY-1 stereotaxic apparatus (Shanghai Chuansha Huamu Agricultural Machinery Factory, China), monitoring video recorder (Shenzhen City Connaught Xinwei Technology Co. Ltd, Shenzhen, china), inverted microscope (Nikon Shanghai Instrument Co. Ltd., Shanghai, China), constant temperature oven (Shanghai Hengyi Scientific Instrument Co., Ltd., Shanghai, China), paraffin slicing machine (Leica Micro Systems Ltd, Germany), protein electrophoresis transfer equipment (Bio-Rad, Hercules, CA, USA), western-blot chemiluminescence image analysis system (DNR Bio-imaging systens, Jerusalem, Israel). A total of 160 healthy adult male SD rats were used in the study. We implanted electrodes for the 160 rats. Briefly, all of the rats were anesthetized at a dose of 10% chloral hydrate (0.3 ml/100 g) i.p. and placed in a stereotaxic apparatus. The bipolar electrode was implanted into the right basolateral amygdala. The stereotaxic coordinates were taken from the rat brain atlas of Paxinos and Watson . as follows: 2.8 mm posterior to the bregmatic fontanel, 4.9 mm lateral to the midline on the right, and 8.6 mm ventral to the skull surface. A screw was fixed in the skull over the left frontal cortex as a reference electrode. The electrodes were connected to three-hole wire connectors and fixed to the surface of the skull using superglue blended with denture acrylic. After implantation of the electrode, the rats were returned to the breeding cages. Penicillin (40,000 U/kg) was injected intraperitoneally for three consecutive days to prevent infection. Finally, 19 rats died unexpectedly, the electrodes fell off in 10 rats. The remaining 131 rats were randomly allocated into an normal group(NRC group, n=10),amygdale-kindling control group (AKC group, n=40), lithium chloride-pilocarpine control group(LPC group, n=40), or a pilocarpine followed by amygdale-kindling group(PAK group, n=41). The AKC group was subjected to chronic stimulation in the amygdale to generate a model of TLE. The LPC group received only peritoneal injection of lithium chloride-pilocarpine to induce a model of TLE. The PAK group, however, received small dosage of peritoneal injection of lithium chloride-pilocarpine prior to chronic amygdale stimulation. The NRC group was fed in the same environment as the other groups after electrode implantation and was sacrificed at the same time. In the PAK group, lithium chloride was injected at a dose of 127 mg/kg i.p. 7 days after the electrode implantation surgery. After injecting lithium chloride 18 hours later, one single dose of pilocarpine, 10 mg/kg i.p. was administered. The rats were then returned to the cage for subsequent experiments. In the LPC group, the rats were given an intraperitoneal (i.p.) injection of lithium chloride (127 mg/kg) 7 days after the electrode implantation surgery, after injecting lithium chloride 18 hours later, rats were injected with pilocarpine, 10 mg/kg i.p., every 30 min . The rats received an i.p. injection of 1 mg/ kg atropine methyl nitrate 30 min before the administration of pilocarpine to reduce its peripheral cholinomimetic effects. Seizures were scored in each rat by Racine’s scale . The repeated low-dose injections of pilocarpine were stopped when the rat developed a generalized (stage 4/5) seizure. The rats received an i.p. injection of 10 mg/kg diazepam to terminate convulsions 1 hour after Licl/pilocarpineinduced seizures. The rats in stages 4 and 5 were considered successfully kindled in the acute period and were included in the study. Followed, spontaneous recurrent seizures of the model rats in chronic period were monitored by a video recording system for 30 days and only rats with spontaneous epilepsy were considered the rats with successful TLE modeling [17,18]. The methods used to prepare the amygdala kindling TLE model were identical to our previously published studies [19-21]. The rats after being administrated of pilocarpine in the PAK group and the rats after being finished the electrode implantation surgery 7 days later in the AKC group were subjected to the amygdala after discharge threshold measurement procedures. The initial current intensity was 0.02 mA with a frequency of 60 Hz and pulse duration of 1.0 ms. Train stimulation with a 0.05 ms delay was administered with an interval of 15.65 ms between pulses within the train and the length of the stimulation train was 160pulses. The amygdala after discharge threshold (ADT) was recorded after each stimulation. The rats were stimulated at an interval of 5 min and the currentintensity was increased by 20% each time until discharges lasting for 3 s (or longer) were observed. The current intensity that produced the discharges mentioned above was considered the ADT. 10 minutes after the ADT was determined, the rats were subjected to the kindling procedures. The parameters for the kindling stimulation were as follows: the frequency was 60 Hz, the pulse duration was 0.1 ms, and the current intensity was 0.4 mA . The kindling stimulation was administered once daily. The duration of the stimulation was 20 minutes . The rats were placed in a shielded room to avoid electrical disturbances when stimulated. Following each stimulus, the EEG and seizure degree were recorded. Behavior was continuously monitored by a camera-control monitor during electrical stimulation and 24 h thereafter. The kindled seizures were considered successful when an after discharge appeared on the amygdala EEG and three consecutive stage 5 seizures were observed in rats. Behavioral seizure stages classified by Racine were used to characterize the behavioral seizure severity during daily kindling. Followed, spontaneous recurrent seizures of the model rats in chronic period were monitored by a video recording system for 30 days and only rats with spontaneous epilepsy were considered the rats with successful TLE modeling. Upon the completion of successful TLE modeling, the rats were sacrificed with chloral hydrate (10%, 0.4 ml/100 g) i.p. And then the rats were placed on their backs on the dissection board and their hearts were exposed. The cardiac apex was localized, and a blunt puncture needle was inserted into the left ventricle to the aorta ascendens under direct vision. The right atrial appendage was then cut to allow blood flow out of the heart. The rats were perfused with 100 ml of cold normal saline through the heart before perfusion with 500 ml 0.01M PBS. The total perfusion time was 1 h. Animals were decapitated and their brains were quickly removed and divided into two parts. One part was fixed in paraformaldehyde for 48 h and then embedded in paraffin. The brain tissues were cryostat-sectioned, 5 μm coronal sections for immunofluorescence and 10 μm thickness for Nissl’s staining analysis. Another part of the brain was stored in the -80°C refrigerator for western-blot analysis. Brain sections were deparaffinized, rehydrated in a graded series of ethanol, and then incubated in 0.3% H2O2 for 10 min. After antigen retrieval, the sections were permeabilized with 0.2% Triton X-100, and then incubated in 2% fetal bovine serum for 1h at room temperature. Next, the sections were incubated in the primary antibody, rabbit anti-GABAAR (1:200), rabbit anti- GFAP (1:200), and rabbit anti-zinctransporter 3 (ZnT3) (1:3000) overnight at 4°C. After washing, they were incubated in the secondary antibody, fluorescein (FITC)-conjugated Affini donkey anti-mouse IgG (H+L), Alexa Fluor 594-conjugated donkey anti mouse for 2h at room temperature. After rinsing in PBS, they were incubated in DAPI (1:5000) for 5min. Sections were mounted onto glass slides and cover-slipped with antifade mounting medium. Images were taken with a laser scanning confocal microscope. The brain sections were stained with 0.75% cresyl violet, dehydrated twice through graded alcohols (70%, 95%, and 100%), cleared in xylenes 3 times for 5 min each, cover slipped with resinous mountant, and we selected four areas for examination with a light microscope to count neuron numbers in the CA1, CA3 and CA4 regions of the hippocampus. The hippocampal samples were homogenized in a buffer containing Tris-HCl, NaCl, Triton X-100 and double-distilled water using a homogenizer. The mixture was centrifuged at 12,000 rpm/min for 15 min at 4°C to isolate the supernatant. After protein quantification, the samples were separated by sodium dodecyl sulfate polyacrylamide gel electrophoresis (SDSPAGE) and transferred onto a polyvinylidene difluoride (PVDF) membrane. The membrane was blocked with blocking buffer overnight at 4°C and incubated the next day with an anti-ZnT3 antibody (1:1000), or anti-GFAP antibody (1:1000) and anti-GABAAR antibody (1:1000) for 1 h at room temperature followed by incubation with a secondary antibody (1:5000). Finally, immunoreactive bands were visualized after incubation in a chemiluminescence substrate and after exposure to film. GAPDH was used as an internal reference to normalize the results and was probed with the same procedures as the primary antibody. The densitometric analysis of the bands was conducted using an image analysis system for Windows. The data were analyzed by SPSS 18.0 software and shown as the mean ± standard deviation (mean ± s). For the comparisons between groups, one-way analysis of variance (one-way ANOVA) was performed after normality test and homogeneity test of variances. Comparisons between two sample means were conducted with the t-test after homogeneity test of variances. Chi-square test and Fisher exact test were used to compare the rates between groups. Statistical significant was defined as p < 0.05. The kindling time in the PAK group was significantly shorter than that in the AKC group (Table 1). The success rate of TLE modeling of the PAK group was significantly higher as compared with the AKC group. In the PAK group, 2 rats developed SE after the injections of pilocarpine and were abandoned, the remaining 39 rats were involved in the amygdala electric kindling procedure and then the epileptic model was successfully prepared in 35 rats. Within 30 days after the onset of kindling, 6 rats died unexpectedly and 27 rats have spontaneous seizures. The rate of successfully prepared model of epilepsy was 69.2%. In the LPC group, 40 rats were involved by the repeated application of low doses (10 mg/kg) of pilocarpine at 30-min intervals for the pilocarpine-induced epilepsy procedure. 2 rats developed SE after the first injections of pilocarpine, 15 rats developed SE after two injections of pilocarpine. Overall, 36 of 40 rats were successfully developed SE. Within 30 days after the onset of SE, 16 rats died unexpectedly and 19 rats have spontaneous seizures. The rate of successfully prepared model of epilepsy was 47.5%. In the AKC group, 40 rats were involved in the amygdala electric kindling procedure and then 29 rats were successfully kindled. Within 30 days after the onset of kindling, 4 rats died unexpectedly and 17 rats has spontaneous seizures. The success rate was 42.5% (Table 2). ***Compared with the AKC group (p<0.001). Table 1: Comparison of the kindling time between the PAK and the AKC group (͞x ± S, day). *Compared with the PAK group (p<0.05); ##Compared with the LPC group(p<0.005). Table 2: The rate of successful preparation of the TLE model (%) and the rate of morality (%). In the PAK group, 39 rats were used for TLE modeling, 6 rats died during the process of modeling. The mortality was 15.4%. In the LPC group, 40 rats were used for epilepsy modeling and 16 rats died unexpectedly after SE. The mortality was 40%. In the AKC group, 40 rats were used for TLE modeling, 4 rats died during the process of modeling. The mortality was 10% . The mortality in the PAK group decreased significantly compared to the LPC group and displayed no difference compared with the AKC group (Table 2). Upon the completion of successful TLE modeling, 29 epileptic rats survived in the PAK group, 20 epileptic rats survived in the LPC group, and 25 epileptic rats survived in the AKC group. The number of times of epileptic seizures and the duration of epilepsy in epileptic rats were recorded. Details of spontaneous epilepsy are as follows: within 30 days after the onset of amygdala electric kindling or pilocarpineinduced SE,27 of 29 rats in the PAK group, 19 of 20 rats in the LPC group, and 17 of 25 rats in the AKC group displayed spontaneous seizures of IV-V grade. Moreover, the number of times of epileptic seizures in the PAK and LPC groups was all significantly higher than that in the AKC group within the 30 days (Table 3). Table 3: The epileptic seizures among groups with seizure duration (͞x ± S, seconds), seizure degree (͞x ± S, rank), and the number of times of seizures (͞x ± S, frequency). 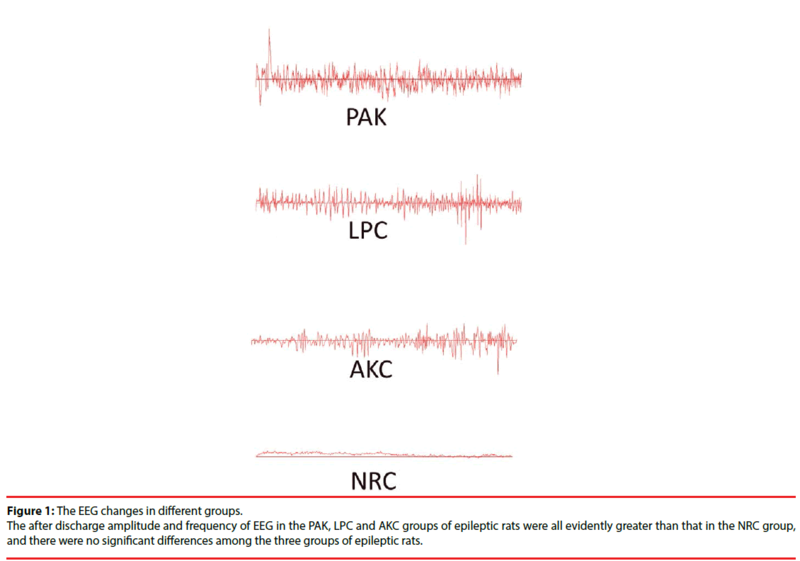 The after discharge frequency and amplitude of EEG of epileptic rats in the PAK, LPC and AKC group were all evidently greater than that in the NRC group, and there were no significant differences among the three groups of epileptic rats (Table 4, Figure 1). ***Compared with the NRC group (p<0.001). Table 4: The EEG changes among groups with after discharge amplitude (͞x ± S, μv) and frequency (͞x ± S, Hz). Figure 1b: The EEG changes in different groups. The after discharge amplitude and frequency of EEG in the PAK, LPC and AKC groups of epileptic rats were all evidently greater than that in the NRC group, and there were no significant differences among the three groups of epileptic rats. Nissl’s staining was used to observe the number of hippocampal pyramidal cells in the CA1,CA3 and CA4 area of the hippocampus. Compared with the NRC group, we found significant hippocampal neuronal loss of epileptic rats in PAK, LPC and AKC group. However, no significant differences were observed among the three groups (Figure 2). Figure 2: The number of hippocampal pyramidal cells. Nissl’s staning was applied to assess the hippocampal cells in CA1, CA3, and CA4 areas among the NRCgroupand epileptic rats in the PAK, LPC, and AKC groups. Epileptic rats in the PAK, LPC and AKC groups all showed significant cell loss than the NRC group. ***Compared with the NRC group(p<0.001). Immunofluorescence and western-blot were adopted to observe the expression of ZnT3, GFAP and GABAA receptor. Compared with the NRC groups, the expression of ZnT3 in the three groups were all showed a significant increase (Figure 3-6). The expressions of GFAP in the PAK, LPC, and AKC groups were significantly higher than that in the NRC group (Figures 4 and 6). While the expression of GABAA receptor was the opposite of GFAP (Figures 5 and 6). Figure 3: Expression of ZnT3 in different groups. All of the epileptic rats in the PAK, LPC, and AKC groups showed significantly up regulation of ZnT3 as compared with the NRCgroup. ***Compared with the NRC group(p<0.001). Figure 4: Expression of GFAP in different groups. Compared with the NRCgroup, significantly up regulation of GFAP were found in all the epileptic rats of the PAK, LPC, and AKC groups. ***Compared with the NRC group(p<0.001). Figure 5: Expression of GABAA receptors in different groups. Compared with the NC group, significantly down regulation of GABAA receptors were found in all the epileptic rats of the PAK, LPC, and AKC groups. ***Compared with the NRC group(p<0.001). Figure 6: The results of western-blot in different groups. 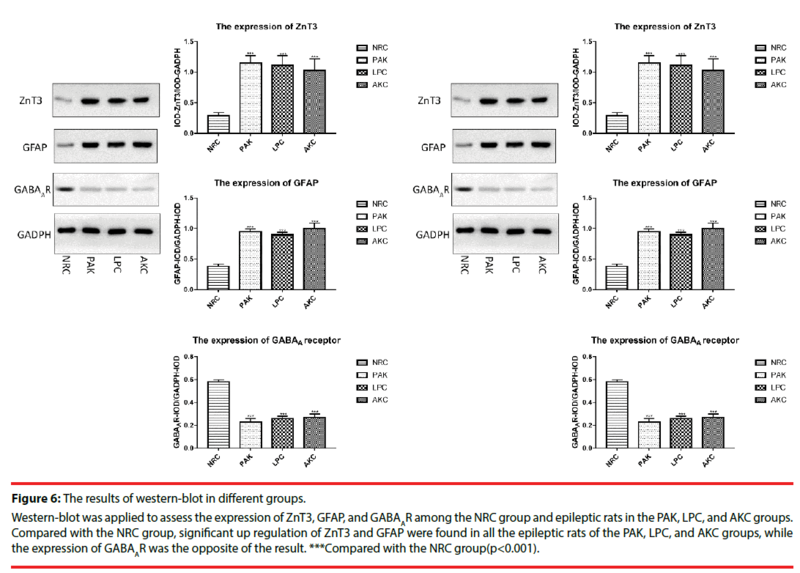 Western-blot was applied to assess the expression of ZnT3, GFAP, and GABAAR among the NRC group and epileptic rats in the PAK, LPC, and AKC groups. 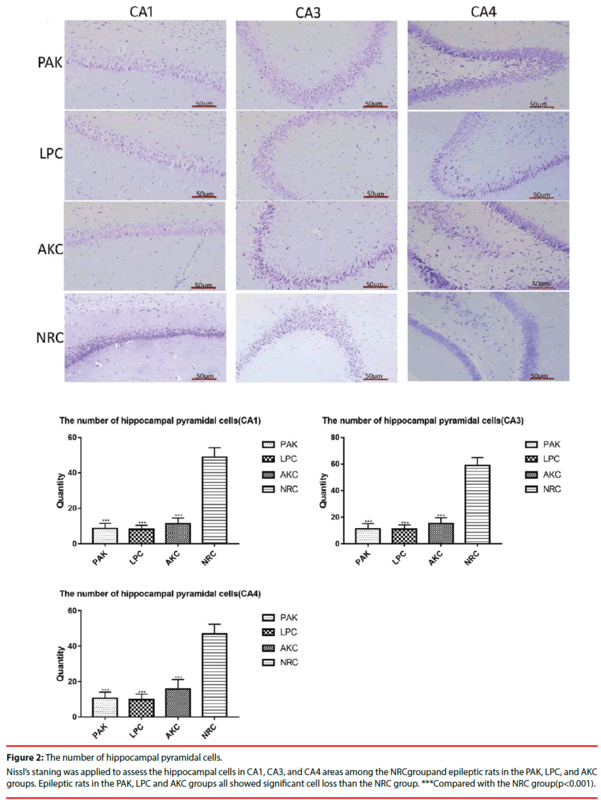 Compared with the NRC group, significant up regulation of ZnT3 and GFAP were found in all the epileptic rats of the PAK, LPC, and AKC groups, while the expression of GABAAR was the opposite of the result. ***Compared with the NRC group(p<0.001). Approximately 20%–30% of patients with epilepsy continue to have seizures despite carefully monitored treatment with AEDs . The use of TLE models is essential because it may help to elucidate mechanisms of resistance and develop and validate novel strategies to overcome resistance as well as imaging strategies to predict drug responses. In choosing a TLE model, one must consider the validity of the model in order to mimic the clinical situation, as well as practical aspects, such as the time and effort necessary to obtain data . As already discussed by Wolfg ang Löscher in a comprehensive review , TLE models could be categorised as: 1. Kindling model of temporal lobe epilepsy, which is one of the most intensely characterized chronic epilepsy models that is based on the repeated electrical elicitation of seizure activity via an implanted depth electrode. 2. Post - status epilepticus models, which can be experimentally induced in rodents by prolonged electrical stimulation or by administration of chemoconvulsants such as pilocarpine or kainic acid. And 3. Models with limited or poor drug response. Although the kindling is generally considered a model of acquired TLE, several critical arguments have been raised however. One of the biggest controversies is that kindled rats do not exhibit enough spontaneous seizures after kindlimg. While in pilocarpine model, it resembles temporal lobe epilepsy (TLE) in humans in its electrographic, behavioral, and morphologic alterations . In models with systemic administration of pilocarpine, SE is terminated after 60 to 90 min by AEDs to reduce the otherwise high mortality associated with chemically induced SE. However, pilocarpine induced SE is more severe than SE induced by electrical stimulation and more difficult to terminate by AEDs such as diazepam, and rats that did not develop SE after pilocarpine nevertheless developed spontaneous recurrent seizures after a latent period of several months . Our study was performed to establish an improved animal model of TLE, which is easier to be kindled and has more spontaneous seizures than the amygdala kindling model, has less mortality than the lithium-pilocarpine TLE model, and could be identified to have the similar pathological changes as the TLE brain. In the present study, lithium chloride treated rats were administered with a single low dose of pilocarpine (10 mg/kg), this dosage of pilocarpine hardly to cause SE unless repeated injections in rats . We observed that after being injection a single low dose of pilocarpine to lithium chloride treated rats, only 0.05% rats(4/79) had SE. The most critical point in this study was the comparison among the lithium chloride-pilocarpine combined electric kindled model (PAK group), the single lithium chloridepilocarpine model (LPC group), and the single amygdale kindled model (AKC group). We observed that the time required for kindling the rats in the PAK group was significantly decreased as compared with the AKC group. We also discovered that the number and frequency of spontaneous epilepsy of epileptic rats in the PAK group were significantly higher than those in the AKC group. Especially, the mortality in the PAK group was obviously lower than that in the LPC group. These mean that combing lithium chloride-pilocarpine with the electrically kindling, the rats showed higher excitability than simple electrically kindling. However, the mortality of this study shows that the brain damage caused by the modified model in rats is not as severe as the lithium chloride-pilocarpine model. Therefore, the improved model made up for the disadvantage of high mortality in lithium chloride-pilocarpine model. The pathological hallmarks of refractory epilepsy are hippocampal cell loss, gliosis and mossy fiber sprouting . Astrogliosis, involves structural and metabolic changes in astrocytes, is often a prominent feature of temporal epilepsy and most animal models of recurrent seizures. The result of a reactive gliosis characterized by upregulation of GFAP expression . The mossy fiber sprouting in the hippocampus of pharmacoresistant epileptic rats could be reflected by the expression of ZnT3. Zinc transporter family members (ZnTs) is a class of a zinc ion transporter that was discovered recently. It’s function is to transport the free zinc ions in the cytoplasm to the outside of the cell membrane or inside the organelles . So far, there are eight kinds of genes have been identified and named as ZnT1- ZnT8. Among them, ZnT3 is a zinc transporter expressed on the synaptic vesicle membrane at the terminal protuberances of zinc-containing neurons. ZnT3 is believed to be involved in the transport of zinc ions into synaptic vesicles . Recent studies have found that ZnT3 can be used as a marker of moss fiber sprouting [33-36]. Besides, many factors are involved in the development of pharmacoresistant epilepsy. The main theories surrounding the mechanism of pharmacoresistance include the multidrug transporter theory and the therapeutic target theory. The target hypothesis holds that epilepsy-related changes in the properties of the drug targets themselves may result in reduced drug sensitivity. One of the most important therapeutic targets is GABA receptor. Decreased GABAA receptor density and/or function might be one of the important factors in the epileptogenesis of pharmacoresistant epilepsy . In this research, the number of hippocampal pyramidal cells, the expression of ZnT3, and the expression of GFAP and GABAA receptor were observed. 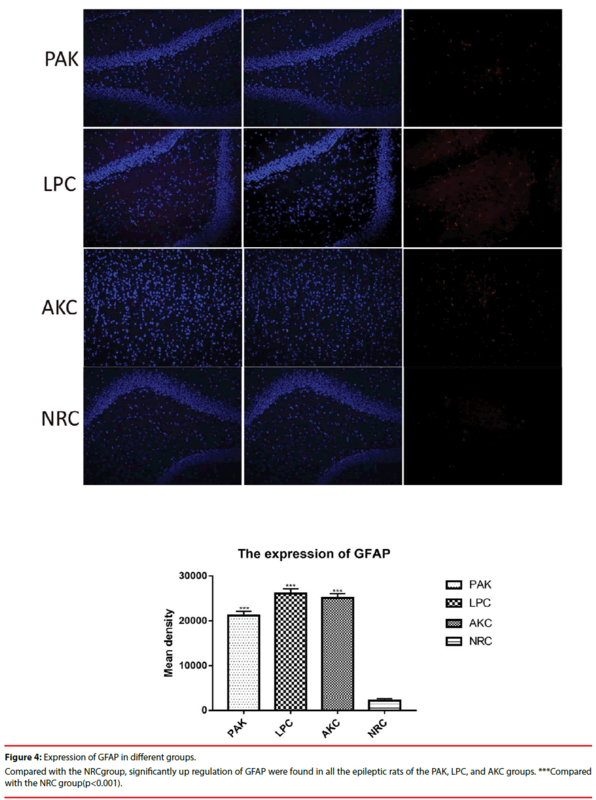 The number of hippocampus pyramidal cells, the expression of ZnT3, and the expression of GABAA receptor in pharmacoresistant epileptic rats of successfully ignited rats (PAK, LPC, AKC group) were all significantly higher than normal rats (NRC group) which were not involved in the ignition process, and the expression of GFAP is the opposite similarly in this research. This illustrated that the ignition process aggravated the reduction of hippocampal pyramidal cells and GABAA receptor expression, promoted MFS and astrocyte hyperplasia. These pathological findings confirmed the feasibility of the reformative model in our research as a model of epilepsy. Our research found that the pathological features of the amygdala kindling model (AKC group) were consistent with the results of the reformative model (PAK group) and lithium chloride-pilocarpine model (LPC group). We have some puzzled about the results: Some researches indicated that total neuronal number in the amygdala or hilus are not reduced after few amygdala-induced seizures . Amygdala kindling should have minimal or no cell loss. While another studies found that the loss of hippocampal neurons were found in the epileptic rats of amygdala kindling rat epileptic model . We analyzed that in our research, after successfully kindling of the amygdala, the rats were continue to be observed by 30 days, only rats with spontaneous epilepsy can be selected and rats without spontaneous epilepsy were discarded. The more spontaneous epilepsy, the hippocampal damage in spontaneous epileptic rats may be more serious, so the pathological changes in the AKC group were similar with the other two models. T﻿﻿﻿he weakness of our study was that no further studies have been done on the rats without spontaneous epilepsy in the amygdala kindling rat. We hope that further experiments can make up for this regret. Besides, it’s possible that reducing the amount of pilocarpine and following this with amygdala kindling would result in less extra hippocampal damage, and limit the hippocampal sclerosis to one side. However, we have not done the related research yet. In future studies, we will focus on the concentration of variety in each side of the hippocampus. In conclusion, we showed that lithium chloridepilocarpine combined electric ignition model is a reliable and efficient model to study refractory epilepsy, because it induced SE, SRSs, epilepsy manifestation of amygdala after discharge, hippocampal cell loss, astrocyte hyperplasia, MFS, and reduced GABAA receptor expression. In addition, the improved model obviously shortens the kindling time and raised the TLE modeling rate compared with the single electric kindling model. Moreover, the mortality in the modified model was evidently lower than the singlelithium chloride-pilocarpine model. Therefore, the reformative model is more timesaving and effective than the single electric kindling model and single lithium chloridepilocarpine model. We are grateful for the help provided by the Clinical Research Centre of Affiliated Hospital of Guizhou Medical University. We also wish to thank all the postgraduates that were involved in this study for their hard work. This work was supported by the Natural Science Foundation of China (grants no: 81760245/ H0913 and 81560222/H0913). Rosillo-de la Torre A, Luna-Barcenas G, Orozco-Suarez S, et al. Pharmacoresistant epilepsy and nanotechnology. Front. Biosci E6: 329-340 (2014). Akdemir V, Sut N, Guldiken B. Factors affecting the quality of life in drug-resistant epilepsy patients. Acta. Neurol. Belg 116(1), 513-518 (2016). Loscher W. Animal models of seizures and epilepsy: past, present, and future role for the discovery of antiseizure drugs. Neurochem. Res 42(7), 1873-1888 (2017). Loscher W, Rundfeldt C. Kindling as a model of drug-resistant partial epilepsy: Selection of phenytoin-resistant and nonresistant rats. Pharmacol. Exp. Ther 258(1), 483-489 (1991). Löscher W. Experimental models for intractable epilepsy innonprimate animal species.. Eds D. Schmidtand P. L. Morselli. Raven Press: New York 25-37 (1986). Löscher W, Schmidt D. Which animal models shouldbe used in the search for new antiepileptic drugs? A proposalbased on experimental and clinical considerations. Epilepsy. Res 2(1), 145-181 (1988). Levesque M, Avoli M, Bernard C. Animal models of temporal lobe epilepsy following systemic chemoconvulsant administration. J. Neurosci. Methods 260(1), 45-52 (2016). Curia G, Longo D, Biagini G, et al. The pilocarpine model of temporal lobe epilepsy. J Neurosci Methods 172(1), 143-157 (2008). Pitkanen A and Halonen T. Prevention of epilepsy. Trends. Pharmacol. Sci 19(1), 253-255 (1998). Loscher W, Brandt C. Prevention or modification of epileptogenesis after brain insults: experimental approaches and translational research. Pharmacol. Rev 62(4), 668-700 (2010). Jope RS, Morrisett RA, Snead III OC. Characterization of lithium potentiation of pilocarpine-induced status epilepticus in rats. Exp. Neurol 91(1), 471-480 (1986). Morrisett RA, Jope RS, Snead III OC. Effects of drugs on the initiation and maintenance of status epilepticus induced by administration of pilocarpine to lithiumpretreated rats. Exp. Neurol 97(1), 193-200 (1987). Clifford DB, Olney JW, Maniotis A, et al. The functional anatomy and pathology of lithium-pilocarpine and high-dose pilocarpine seizures. Neuroscience 23(1), 953-968 (1987). Paxinos G, Watson C. The Rat Brain in Stereotaxic Coordinates. Academic Press, San Diego, CA. Maike Glien, Claudia Brandt, Heidrun Potschka. Repeated low-dose treatment of rats with pilocarpine: low mortality but high proportion of rats developing epilepsy. Epilepsy. Research 46(1), 111-119 (2001). Racine RJ. Modifcation of seizure activity by electrical stimulation. Electroencephalogr. Clin. Neurophysiol 32(1), 281-294 (1972). Marion Bankstahl, Jens P. Bankstahl, Wolfgang Löscher. Pilocarpine-induced epilepsy in mice alters seizure thresholds and the efficacy of antiepileptic drugs in the 6-Hertz psychomotor seizure model. Epilepsy. Research 107(1), 205-216 (2013). Jangsup Moon1, Soon-Tae Lee1, Jiye Choi, et al. Unique Behavioral Characteristics and microRNA Signatures in a Drug Resistant Epilepsy Model. PLoS. One.9(1), e85617 (2014). Wu G, Hong Z, Li Y, et al. Effects of low-frequency hippocampal stimulation on gamma-amino butyric acid type B receptor expression in pharmacoresistant amygdaloid kindling epileptic rats. Neuromodulation 16(2), 105-113 (2012). Wang L, Shi J, Wu G, et al. Hippocampal low-frequency stimulation increased SV2A expression and inhibited the seizure degree in pharmacoresistant amygdala-kindling epileptic rats. Epilepsy. Res 108(9), 1483-1491 (2014). Wu G, Wang L, Hong Z, et al. Hippocampal low-frequency stimulation inhibits afterdischarge and increases GABA (A) receptor expression in amygdala-kindled pharmacoresistant epileptic rats.Neurological Research.2017;39(8):733-743. Nissinen J, Halonen T, Koivisto E, et al. A new model of chronic temporal lobe epilepsy induced by electrical stimulation of the amygdala in rat. Epilepsy. Res 38(1), 177-205 (2000). Wolfgang Loscher, Elke Reissmuller, Ulrich Ebert. Anticonvulsant efficacy of gabapentin and levetiracetam in phenytoin-resistant kindled rats. Epilepsy. Research 40(1), 63-77 (2000). Brandt C, Bethmann K, Gastens AM, et al. The multidrug transporter hypothesis of drug resistance in epilepsy: proof-of-principle in a rat model of temporal lobe epilepsy. Neurobiol. Dis 24(1), 202–211 (2006). Loscher W, Reissmuller E, Ebert U. Anticonvulsant efcacy of gabapentin and levetiracetam in phenytoinresistant kindled rats. Epilepsy. Res 40(1), 63-77 (2000). Heidrun Potschka. Animal models of drug-resistant epilepsy. Epileptic. Disord 14(3), 226-234 (2012). Loscher W. Critical review of current animal models of seizures and epilepsy used in the discovery and development of new antiepileptic drugs. Seizure 20(1), 359-368 (2011). Harvey Kupferberg. Animal Models Used in the Screening of Antiepileptic Drugs. Epilepsia 42(1), 7-12 (2001). Du X, Zhang H, Parent JM, et al. Rabies tracing of birthdated dentate granule cells in rat temporal lobe epilepsy. Ann. Neurol 81(6), 790-803 (2017). Lu S, Wang f, Huang HJ, et al. Pathological changes of astrocytes under seizure. Int. J. Brain. Treat 2(1), 008 (2016). Kambe T, Yamaguchi-Iwai Y, Sasaki R, et al. Overview of mammalian zinc transporters. Cell. Mol. Life. Sci 61(1), 49-68 (2004). Seve M, Chimienti F, Devergnas S, et al. In silico identification and expression of SLC 30 family genes: an expressed sequence tag data mining strategy for the characterization of zinc transporter’s tissue expression. BMC Genomics 5(1), 32 (2004). Zhi-Hong Chi, Xin Wang, Ji-Qun Cai, et al. Zinc transporter 3 immunohistochemical tracing of sprouting mossy fibers. Neurochemistry. International 52(1), 1035-1039 (2008). Palmiter RD, Cole TB, Quaife CJ, et al. ZnT3, a putative transporter of zinc into synaptic vesicles. Proc. Natl. Acad. Sci. USA 93(1), 14934-14939 (1996). Cole TB, Wenzel HJ, Kafter KE, et al. Elimination of zinc from synaptic vesicles in the intact mouse brain by disruption of the ZnT3 gene. Proc. Natl. Acad. Sci. USA 96(1), 1716-1721 (1999). Michael S. Hester, Steve C. Danzer. Accumulation of abnormal adult-generated hippocampal granule cells predicts seizure frequency and severity. J. Neurosci 33(21), 8926-8936 (2013). Tuunanen Jand Pitka¨nen A. Do seizures cause neuronal damage in rat amygdalakindling? Epilepsy. Research 39(1), 171–176 (2000). Frantseva MV, Velazquez JLP, Tsoraklidis G, et al. Oxidative stress is involved in seizure-induced neurodegeneration in the kindling model of epilepsy. Neuroscience 97(1), 431–435 (2000).